The 12MP camera in Moto G5 Plus has a larger aperture of f/1.7 (vs f/2.0 in Moto G5). This means Moto G5 plus can take better pictures in low light conditions, or for moving objects. For video recording, Moto G5 Plus camera supports 4K video recording; while Moto G5 camera only supports full HD 1080p. Moto G5 is equipped with a 2800 mAh battery (removable). Moto G5 Plus comes with a 3000mAh battery (non-removable). Although the battery capacity is comparable, the difference in battery life is noticeable. Moto G5 Plus delivers a longer battery life due to its power-efficient CPU/GPU. The 14nm fabrication process of Snapdragon 625 can increase power efficiency about 30%. It is very strange that the location of headphone jack is different in Moto G5 and Moto G5 Plus. 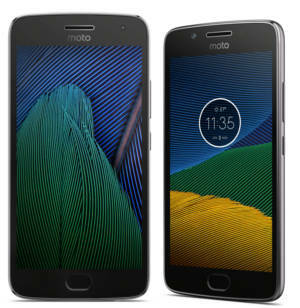 In Moto G5, headphone jack is in the top; while in Moto G5 Plus, it is in the bottom. Some may prefer a headphone jack in the top; others may prefer it in the bottom. One of the most obvious differences between Moto G5 and Moto G5 Plus is the removable back cover in Moto G5. More over, the battery in Moto G5 is also user removable. In previous generations of Moto G, Motorola sometimes used removable back cover with non-removable battery. Removable battery is a luxury for a smartphone nowadays. It is good for owners because you can carry a spare battery or replace the battery easily when it is ageing. Due to the removable back cover in Moto G5, the SIM card slots and micro SD cad slot are also placed differently in Moto G5 and Moto G5 Plus. As explained in this guide, you need to use the ejection tool to eject the SIM card tray for Moto G5 Plus. But for Moto G5, both SIM card slots (dual SIM version) and micro SD card slot are placed inside the phone. You need to remove the battery to insert or change SIM cards and micro SD card as explained in this page. Of course, Moto G5 is cheaper than Moto G5 Plus. But the price difference varies depending on region and configurations (RAM/storage). For the base mode (2GB/16GB for Moto G5 and 2GB/32GB for Moto G5 Plus), the price difference is usually about $50. The cheapest Moto G5 Plus is the Amazon exclusive version at about $185. Moto G5 vs Moto G5 plus: which one is for you? You should get the phone based on your needs and budget. you have very limited budget (for example, less than $200). you want to get longer battery life. Again, there is no perfect phone. But there should be a phone good enough for you. Do you know the difference between Moto G5 and Moto G5 Plus? Can you decide which phone is for you: Moto G5 or Moto G5 Plus? If you have questions on Moto G5 vs Moto G5 Plus, please let us know them in the comment box below. such settings are controlled by your carrier, not your phone. Most carriers do not allow any customization on this unless for call forwarding.